Stoneyhill Studio's, fully furnished with A/C & private pool area. 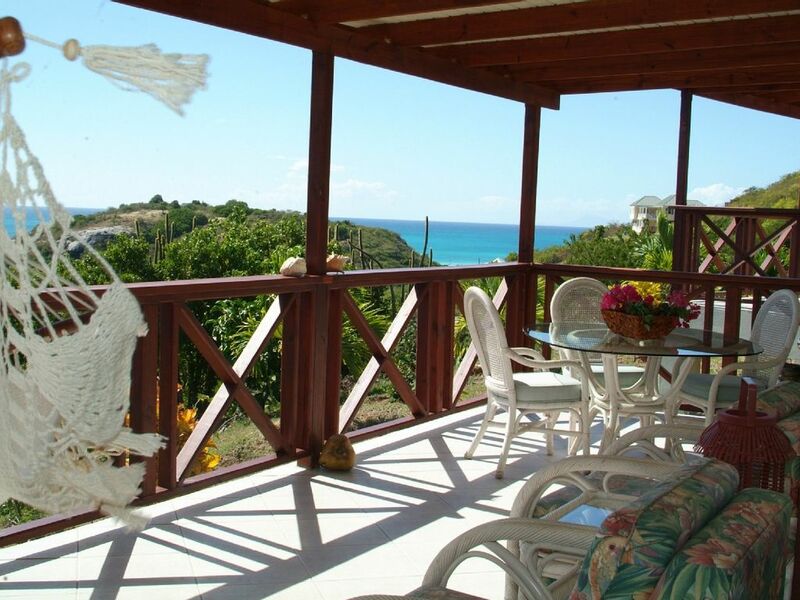 Stoneyhill is a self catering getaway, with breath taking views, which is situated on the west coast of Antigua where you can capture the most amazing sunsets along with the tranquil sounds of nature whispering through the tropical breeze. We are not a resort, Stoneyhill is a private Estate where you come to enjoy the REAL Caribbean. We are there to assist you in all your needs. There are 3 studio apartments, so please still contact us even if the calander says reserved .? This could mean just one is reserved. We recently returned from Karol and Merv's place and we simply fell in love with it! The views are amazing! The cottages are clean and beautifully decorated with everything you need. We enjoyed every evening sitting on the expansive deck just taking in the views, the landscape and the breezes. We honestly could not have imagined a more ideal location! The pool and pool house are perfect! You are just minutes from beautiful beaches, great restaurants and a grocery store for necessities. Best of all, as you will read in so many reviews, are Karol and Merv. They are the kindest people and we enjoyed every opportunity to chat with them and learn more about them and how they have built such an amazing place. They were absolutely wonderful and helpful to us. We are already scheduled to return. They get our highest recommendation! Lastly, the island of Antigua exceeded our expectations! The beaches we visited were just gorgeous, the terrain is stunning and the people were all so kind and welcoming. One of our favorite trips to the Caribbean to date! Charming hosts and breathtaking views! We’re not too much in favor of cruises or all-inclusives and like to meet an interesting person or two, both local and from afar when we travel. In all these respects Carol and Merv’s Stoney Hill Cottages suited us down to the ground. First, the three separate cottages, which are essentially roomy studios with immense wrap-around balconies that pose stunning views of the cove, the turquoise sea and Montserrat in the distance. A short walk down the hill finds you in the mutual cabana and bar area where one can barbecue and join Carol and other guests (as one wishes) with the pool and its stunning view. She and Merv are exceptional hosts; they know when to leave one alone and when to step in with good suggestions. We didn’t rent a car, but had a driver for one or two trips, and joined fellow guests for a sail around Antigua and a meal at a nearby gourmet restaurant. Otherwise, we were quite content to spend a day on our balcony, just appreciating how fortunate we are. This was brought into sharp focus when we made the trip to Barbuda, still largely decimated by Hurricane Irma. What a magnificent people! They are spiritually uplifting. When it comes to a journey that meets our liking, Stoney Hill Cottages fit the bill. Judging by the number of return visitors, it suits many others, too. My husband and I just got back from our stay with Karol & Merve at Stoneyhill Studios. We didn't want to leave. We had an absolutely fantastic vacation – we left our perfect little apartment and Antigua incredibly relaxed and extremely happy people. Our studio apt served us so well for 9 nights. When Karol showed us into our unit I lost count how many times we said "WOW" when we saw the view from our balcony. Well, "balcony" isn't the right word – it's a HUGE L-shaped wrap around covered piece of heaven with loungers, a hammock and a dining room table. With stunning views which we never tired of. The studios are spotlessly clean. And well equipped. The pool & bar/BBQ area is a fabulous gathering place at the end of the afternoon for a chilly beverage before making dinner. Stoneyhill is quiet and peaceful – yet close to several beautiful beaches. Our biggest decision each day was which beach we wanted to go to. The well stocked grocery store is a short drive away. What a truly special place this is and Karol and Merve are delightful and considerate hosts. We are so grateful for the fantastic, and well needed vacation. Thank you. We will be back! We stayed Jan 15 to 20, 2019 and absolutely LOVED the place. The cottages are very clean, comfortable and perfectly situated with sweeping views of the hillside and sea. We enjoyed our coffee on the HUGE balcony in the morning while being visited by cute, friendly birds and watched the sunsets there in the evening. There is also a lovely pool & bar area. Just so much positive, I can't list it all. The place is quiet and just a few minutes drive to anything you could want.. beautiful beaches, supermarket, restaurants, etc. And on top of all those wonderful things, there is Karol and Merv. <3 Karol arranged a car rental for us, airport transfers, a local phone to use while there and really made us feel like family. :o) Really amazing people. Thank you Karol & Merv! We can't wait to return! We stayed with Karol and Merv for about a week in June 2018. Let me start out by saying the views for the cottage as well as the pool and bar area are breathtaking!! The process of reserving a cottage was seamless and Karol even gave us assistance as we were not sure of our options regarding car rentals on the island. We were able to secure a rental via Karol with a driver picking us up from the airport and taking us back at the time of departure. Karol was always close if we needed her but gave us the privacy that we needed to freely explore Antigua. Jolly Harbour market is a stones throw away as well as a variety of local restaurants and beaches so there is no issue when it came to dining or activities. Due to some unforeseen health issues we were unable to fully take advantage of the amenities of the Stoney Hill cottages but we will return to the island of Antigua in the future and are looking forward once again to a stay at the Stoney Hill Cottages. Thank you for EVERYTHING Karol!!! Stoneyhill is situated on the SW side of the Island, 5 minutes from Jolly Harbour marina , shopping center & Golf corse, Easy access for all your boat tours, we are also situated between two of the islands most beautiful white sandy beaches and just minutes away from lush green rain forest where you will find the islands only Zip-lining tours. These rates are subject to change for special occasions i,e Sailing week(End April / May) Carnival (End July / Aug) Christmas & New Year. Please contact owner for special rates. We do have 3 studio apartments so please inquire even if the calander says reserved as this could mean only one studio is reserved. Thank you for your time.